This don't pretend to be "Literature". This is just a tale for red-blooded folks who want a story and not just a lot of "psychological" stuff or "analysis". Boy, you'll love it! Read it here, see it in the movies, play it on the phonograph run it through the sewing machine. After all, what is brilliance? Merely the tact to sow when no one is looking and to reap when everyone is. ...his latest note was post-marked from Hornell, New York, which is some distance from Geneva and a very small town; in any case he is almost certainly in that section of the country, in one town or another. Scott Fitzgerald's prolific output of stories for magazines early in his career was distinguished by at least one that was undoubtedly great, many that could be called interesting, and more that are best forgotten (and have been). All three categories are represented in Tales of the Jazz Age, his second story collection in book form. This collection rises above others by the inclusion of the great one, "May Day", and one of the best of the interesting ones, "The Diamond as Big as the Ritz." The long story "May Day" is novel-like in its sweep of characters and interweaving plot. It's the first of May shortly after the First World War and two groups are marking it in different ways in the big city. The young and affluent are living it up at a night club party that becomes an all-night drunk. Meanwhile former soldiers start an anti-Bolshevik demonstration that turns into an attack on a leftist newspaper office. Among the first group are a desperate man seeking a loan from a friend, and a socialite whose brother works for the socialist paper under attack. Their experiences in the course of the evening bring them all together in various combinations and split them irredeemably apart. Even with some dramatic exaggeration everything about this story rings true. The dialogue is brilliantly real. The characters and storyline keep you turning the pages. And there are those situations that only Fitzgerald can dream up but which seem as natural as real life—such as the soldiers hiding in the supply room and watching the party through the door for their chance to steal liquor, or the two revellers taking the In and Out signs from the cloakroom and wearing them to parade about town as Mister In and Mister Out. (You had to be there.) This is a story, like his best novels, that melds Fitzgerald's obvious fascination with wealth with his awareness of a larger world, creating a subtle social critique. Also in the naturalistic vein is the very good "Jelly Bean", about a southern ne'er-do-well who falls for a fickle belle, and "The Camel's Back" about a man who courts his fiancée at a party while dressed as the front half of a camel—although this story slips near the end into burlesque. "The Lees of Happiness" is a less successful example of the realistic style, but interesting to read because its story of two couples never comes together in the way you expect. Other stories are openly fantastic. "The Diamond as Big as the Ritz" concerns a mountain-size diamond secretly owned by the world's richest man who uses black slaves (they don't know slavery was abolished), protects his property with anti-aircraft weapons, and kills his children's friends to prevent them from revealing his secret. Our entry into this demented world is via a friend who comes to visit his schoolmate, falls in love with one of the rich man's nutty daughters and plans his escape. It's all unbelievable but entertaining. Other stories are even less credible. "The Curious Case of Benjamin Button" could have appeared in an Amazing Stories-type pulp magazine. Benjamin Button was born a fully grown old man and grows younger throughout his life. Well done, but perhaps not what you expect from a literary great. The popular 2008 film of the same name is greatly expanded beyond all recognition, except for the reverse-aging premise. Fitzgerald was not only incredibly prolific but incredibly versatile. He adopts a scary range of voices and styles in this small collection, with uneven results. Two of the "stories" are even written as one-act plays, suitable for the theatre of the absurd. My favourite is the bizarre, punning "Mr. Icky". Doesn't make a lot of sense but it's quite funny in a way that Samuel Beckett (Waiting for Godot) might appreciate. And check out that zippy first paragraph of "Jemina", which unfortunately turns out to be a silly satire about a hillbilly feud between the Tantrums and the Doldrums. Many of Fitzgerald's stories from this period seem overly ornamented and somewhat precious in style, making them age badly compared to the more stripped down fiction that became popular later. Personally I prefer his own later leaner writing as in The Pat Hobby Stories. But at least three of the stories in Tales of the Jazz Age have become his best known short works. 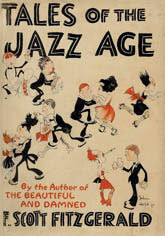 You may not be able to get this original collection under the title Tales of the Jazz Age, as the volume appears to be no longer in print. Apparently a new, expensive hardcover edition is in the works. In the meantime you can find all the stories from this book—except the minor entries "Mr. Icky", "Porcelain and Pink" and "Jemina"—in the more recent collections Babylon Revisited and Six Tales of the Jazz Age and Other Stories. The raw text of the whole book is also available on various sites on the Internet.